Upcoming Mars “Curiosity” Mission: Could It Find Fossil Life? NASA's new Mars rover has instruments to detect organics, but won't be able to determine if any derived from life. The goal of the mission is to understand if the environment could have supported life on Mars — and preserved it. NASA hopes to find answers in Gale Crater, a 96-mile wide impact basin that features a three-mile-high pileup of rock rising from the the crater floor. Analysis of data taken by orbiting Mars probes shows the base of the mountain has two different types of minerals that hold the chemical fingerprints of water. The crater, named after Australian astronomer Walter Frederick Gale, is be;ieved to contain geologic records from a diverse number of environments over huge spans of time, perhaps hundreds or millions of years. The layers of the Gale Crater tell a story about what Mars was like in the past, perhaps spanning much of the history of the red planet. Studies from orbit have revealed that the layers have different minerals depending on their height. Near the bottom of the mound are clay minerals. Above the clay-bearing layers are layers with sulfur and oxygen-bearing minerals are above them. 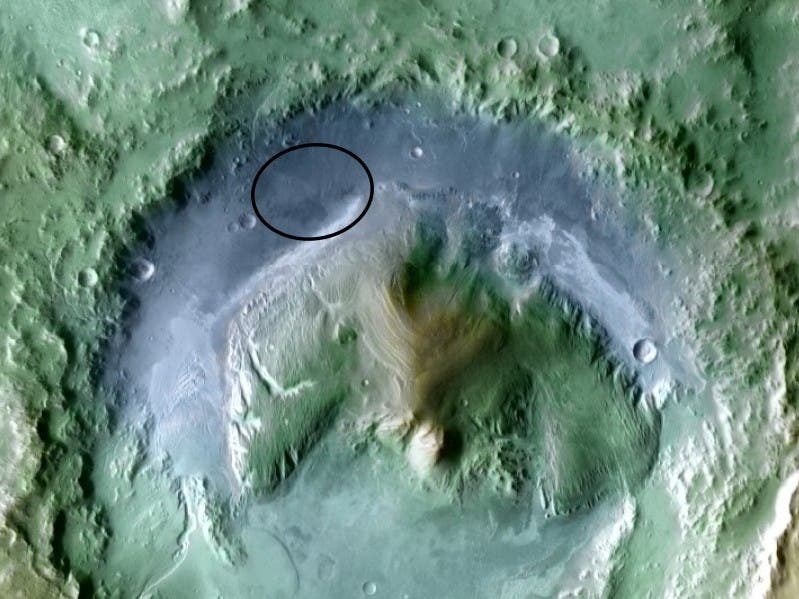 Flowing water appears to have carved channels in both the mound and the crater wall. To get to the mound, the Mars Science Laboratory would land in a flatter part of the crater and carefully work its way upward, layer by layer. Along the way, the rover would investigate how the layers formed and the environments in which they formed. The largest instrument on the Curiosity rover is "Sample Analysis at Mars," or SAM, built by NASA's Goddard Space Flight center. At the carefully selected Gale Crater landing site for the Mars rover named Curiosity, one of SAM's key jobs will be to check for carbon-containing compounds called organic molecules, which are among the building blocks of life on Earth. The clean-room suits worn by Curiosity's builders at NASA's Jet Propulsion Laboratory, Pasadena, Calif., are just part of the care being taken to keep biological material from Earth from showing up in results from SAM. Organic chemicals consist of carbon and hydrogen and, in many cases, additional elements. They can exist without life, but life as we know it cannot exist without them. SAM can detect a fainter trace of organics and identify a wider variety of them than any instrument yet sent to Mars. It also can provide information about other ingredients of life and clues to past environments. Researchers will use SAM and nine other science instruments on Curiosity (landing site image above) to study whether one of the most intriguing areas on Mars has offered environmental conditions favorable for life and favorable for preserving evidence about whether life has ever existed there. NASA will launch Curiosity from Florida between Nov. 25 and Dec. 18, 2011, as part of the Mars Science Laboratory mission's spacecraft. The spacecraft will deliver the rover to the Martian surface in August 2012. The mission plan is to operate Curiosity on Mars for two years. "If we don't find any organics, that's useful information," said Dr, Paul Mahaffy, of NASA's Goddard Space Flight Center. "That would mean the best place to look for evidence about life on Mars may not be near the surface. It may push us to look deeper." It would also aid understanding of the environmental conditions that remove organics. "If we do find detectable organics, that would be an encouraging sign that the immediate environment in the rocks we're sampling is preserving these clues," he said. "Then we would use the tools we have to try to determine where the organics may have come from." Organics delivered by meteorites without involvement of biology come with more random chemical structures than the patterns seen in mixtures of organic chemicals produced by organisms. Mahaffy paused in describing what SAM will do on Mars while engineers and technicians lowered the instrument into its position inside Curiosity this month. A veteran of using earlier spacecraft instruments to study planetary atmospheres, he has coordinated work of hundreds of people in several states and Europe to develop, build and test SAM after NASA selected his team's proposal for it in 2004. "It has been a long haul getting to this point," he said. "We've taken a set of experiments that would occupy a good portion of a room on Earth and put them into that box the size of a microwave oven." SAM has three laboratory tools for analyzing chemistry. The tools will examine gases from the Martian atmosphere, as well as gases that ovens and solvents pull from powdered rock and soil samples. Curiosity's robotic arm will deliver the powdered samples to an inlet funnel. SAM's ovens will heat most samples to about 1,000 degrees Celsius (about 1,800 degrees Fahrenheit). One tool, a mass spectrometer, identifies gases by the molecular weight and electrical charge of their ionized states. It will check for several elements important for life as we know it, including nitrogen, phosphorous, sulfur, oxygen and carbon. Another tool, a laser spectrometer, uses absorption of light at specific wavelengths to measure concentrations of selected chemicals, such as methane and water vapor. It also identifies the proportions of different isotopes in those gases. Isotopes are variants of the same element with different atomic weights, such as carbon-13 and carbon-12, or oxygen-18 and oxygen-16. Ratios of isotopes can be signatures of planetary processes. For example, Mars once had a much denser atmosphere than it does today, and if the loss occurred at the top of the atmosphere, the process would favor increased concentration of heavier isotopes in the retained, modern atmosphere. Methane is an organic molecule. Observations from Mars orbit and from Earth in recent years have suggested transient methane in Mars' atmosphere, which would mean methane is being actively added and subtracted at Mars. With SAM's laser spectrometer, researchers will check to confirm whether methane is present, monitor any changes in concentration, and look for clues about whether Mars methane is produced by biological activity or by processes that do not require life. JPL provided SAM's laser spectrometer. Curiosity is scheduled to be launched on an Atlas 5 rocket from Cape Canaveral Air Force Station in Florida between Nov. 25 and Dec. 18 and arrive at Gale Crater between Aug. 6 and 20, 2012.